In this time, i would like to introduce to you for one greatest site for learning some languages. If you using popular social network like facebook, you exactly just read your friends status and will get bored for sometimes. 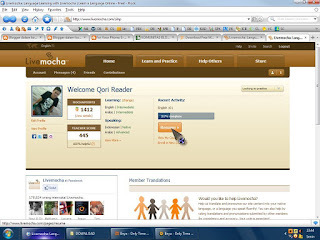 Live Mocha is same social network like facebook and etc, but its have many differences. In Live Mocha, you will meet new friend who want to learn your languange. And so you are, you can learn languange from your friend with their native languange. Live-Mocha also providing some exercises for you with the languange that you choose before. You can be as teacher from your friend and also as student too. Think also that we can share our languange skill to help others. [Thought] New Year, New What? [Exp] How hard is TOEFL test?